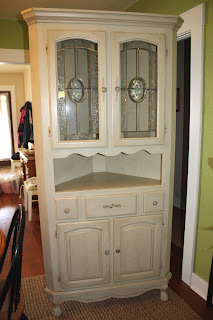 We finally finished our corner cabinet for the dining room......woohoo! 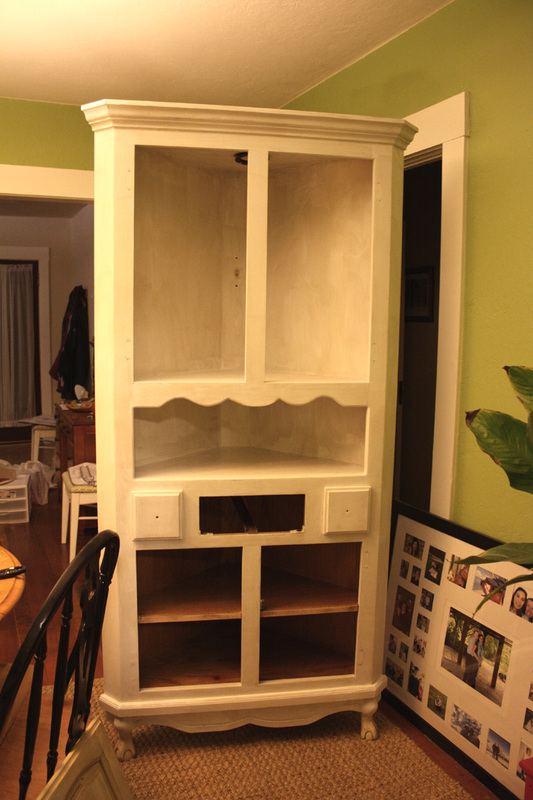 So here's our story of finding, refinishing, and ultimately enjoying our new to us corner cabinet. After the generosity of family and friends with gifts for our wedding we just couldn't find the space to store everything in our kitchen cabinets (and we don't have much storage to begin with!). 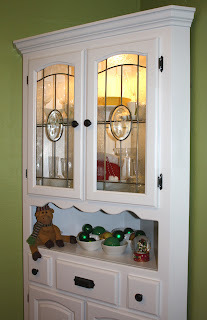 I had been searching and searching on Craigslist, thrift stores, IKEA, everywhere for a cabinet to put in our dining room that was just the right size to hold enough dishes but not be an oversized monstrosity and wouldn't break the bank. We finally found the perfect solution, a corner cabinet on Craigslist and we were in luck we had my parents' truck for the week! So we took a bit of a drive, loaded it up in the back of the truck and brought it on home. After asking the neighbors for help getting it in the house (it was a lot too heavy for me) we had the chance to really evaluate our purchase. 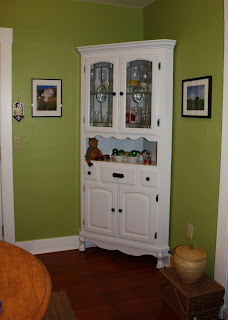 It would work perfectly in our space but something just had to be done about the appearance. 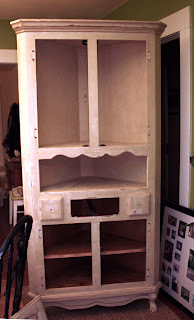 It was a dingy white with brass hardware that would have to go........but it had good bones. So I set to work first removing all the doors, drawers, and hardware and lightly sanding all surfaces with a new sander we bought at Home Depot with a wedding gift card (a thoughtful gift for two diy'ers who visit the store just about weekly!). And then I covered all surfaces to be painted with primer. And the hummingbird etched glass actually doesn't look too bad with the new paint job and hardware.........although it would be nice to see our new dishes a bit more. 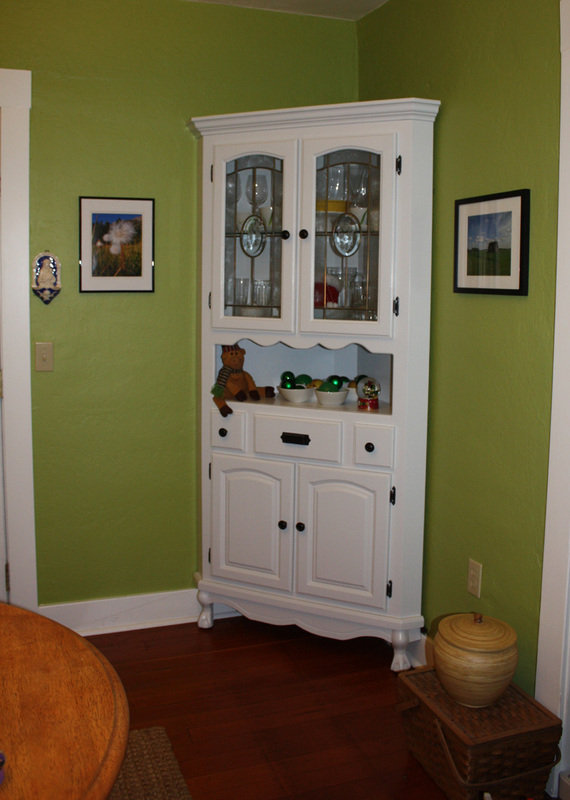 So that completes this adventure, dining room cabinet = SUCCESS! this cabinet looks so beautiful!